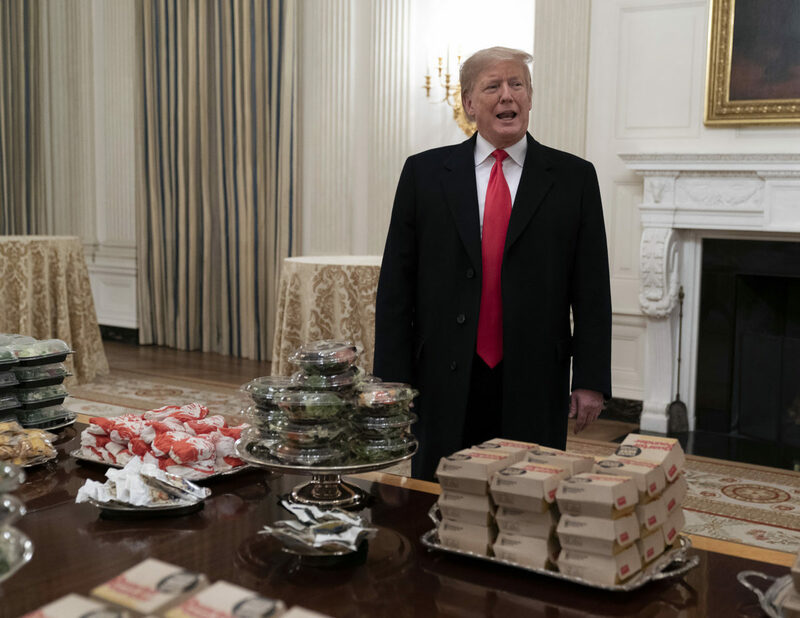 President Donald Trump is personally providing fast food for the Clemson Tigers’ visit to the White House on Monday night, according to White House press secretary Sarah Sanders. A week ago, the Clemson Tigers dominated the Alabama Crimson Tide in the National Championship game, winning 44-16. Freshman quarterback Trevor Lawrence led the team to an undefeated season after starting the season as the backup quarterback. “If it’s American, I like it. It’s all American stuff. … But it’s good stuff and we have the national champion team, as you know, Clemson Tigers. And they had a fantastic game against Alabama and they’re all here. They’re right outside the room and I think we’re going to let you see them,” Trump said to reporters. “But I’ll bet you, as much food as we have — we have pizzas, we have 300 hamburgers, many, many french fries, all of our favorite foods. I want to see what’s here when we leave, because I don’t think it’s going to be much,” he continued. This is Clemson’s second National Championship in the last three years. They also beat Alabama for the 2016 championship, albeit in a much closer game, 35-31. Clemson visited the White House after their 2016 title as well, while some other champions have opted not to make the trip.